The NBA playoffs never disappoint — especially when it comes to kicks. Michael Jordan, Game 6, Allen Iverson and the infamous step over, King James ascending his throne at the Palace of Auburn Hills — each one of these historic playoff moments was seized in a fresh pair of sneaks. From Air Jordans to Converse, player exclusives to limited editions and zip-ups to high-tops, every year, style and circumstance dictate which pair is crowned the freshest of all. Starting with the pinnacle Air Jordan XIIs in 1997 and ending with a heartfelt tribute on a pair of Nike Kobe A.D.s in 2017, these are the most iconic sneakers from every NBA playoffs since 1997. Michael Jordan (No. 23) of the Chicago Bulls rests during Game 5 of the 1997 NBA Finals played against the Utah Jazz on June 11, 1997, at the Delta Center in Salt Lake City. No pair of sneakers on this list — or in the history of the NBA playoffs, for that matter — is more legendary than the Air Jordan XIIs that Michael Jordan wore on June 11, 1997, in Game 5 of the NBA Finals. In them, Jordan played through “flulike symptoms” (although his personal trainer revealed years later that it was food poisoning, while conspiracy theorists still believe the sickness was the result of a hangover) to put up an incredible 38 points (13-of-27 field goals, 10-of-12 free throws), seven rebounds, five assists and three steals in 44 minutes. 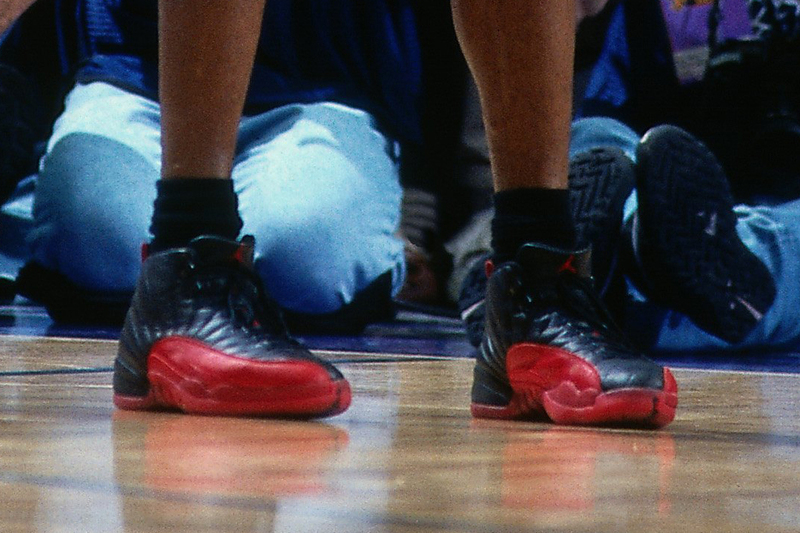 Like the game itself, the red-and-black colorway of the Air Jordan XIIs he wore that night has since been referred to as the “Flu Game.” In 2013, the autographed game-worn shoes, which Jordan gave to a Utah Jazz ball boy after his performance, were sold at auction for $104,765. No game-worn Jordan shoes have ever been sold for more. Michael Jordan (No. 23) of the Chicago Bulls celebrates after a play against the Utah Jazz in Game 3 of the 1998 NBA Finals at the United Center on June 5, 1998, in Chicago. Psycho: I’m liable to go Michael, take your pick / Jackson, Tyson, Jordan, Game 6, raps Jay Z on the 2011 hit “N—-s in Paris.” Jay references Game 6 of the 1998 NBA Finals between the Chicago Bulls and Utah Jazz, which produced one of the greatest shots of Michael Jordan’s career: a 20-foot jumper over Bryon Russell with 5.2 seconds left that ultimately won the game and a sixth championship for Jordan and the Bulls. 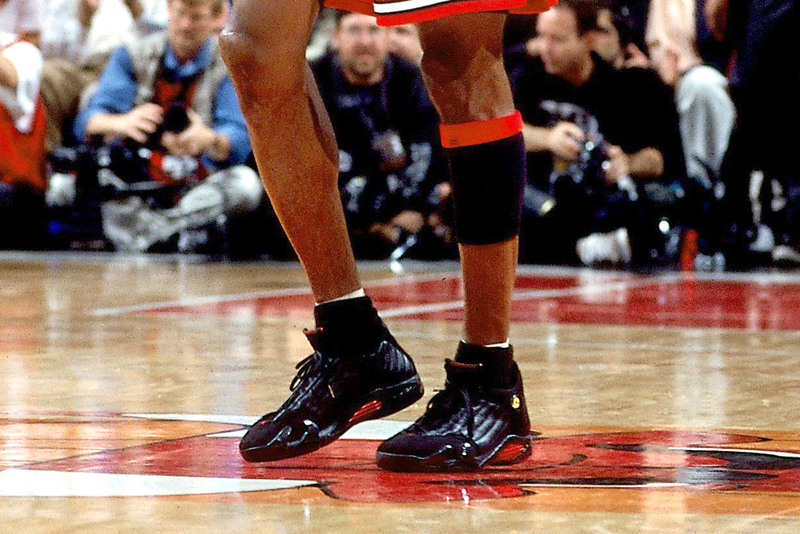 The sneaker Jordan wore in this moment was dubbed the Air Jordan XIV “Last Shot” because in January 1999 he announced his second retirement from the NBA, making the jumper not only his last shot in Game 6 but also the last shot of his career — at least at the time. Jordan returned to the NBA in 2001 to play for the Washington Wizards for two seasons, so the XIVs now commemorate the “last shot” Jordan took as a Chicago Bull. Kevin Garnett(R) of the Minnesota Timberwolves shoots over San Antonio Spurs’ Tim Duncan(L) for two of his 23 points during second half action at the Alamodome in San Antonio, Texas 11 May 1999. For the 1999 playoffs, Nike blessed a then-22-year-old Kevin Garnett with Nike Air Flightposite player exclusives (PEs) for the first round, which saw Garnett and the Minnesota Timberwolves face Tim Duncan and the San Antonio Spurs. These rare black-and-white PEs are glorious — with Garnett’s initials on the tongue of each zip-up shoe and the words “The Future” on each heel tab. 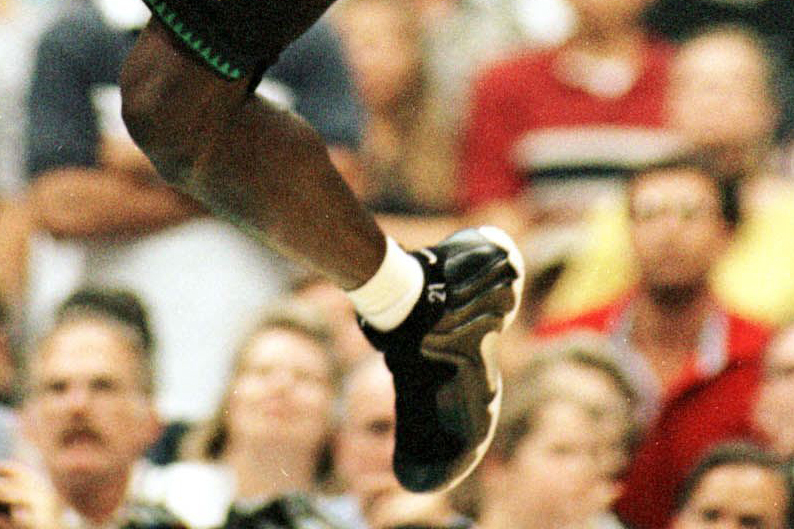 The Spurs beat the Timberwolves, 3-1, in a best-of-five series, but Garnett won the sneaker battle against his then-fellow Nike-endorsed athlete (and career-long foe) Duncan, who sported the Nike Air Vis Zoom Uptempo. 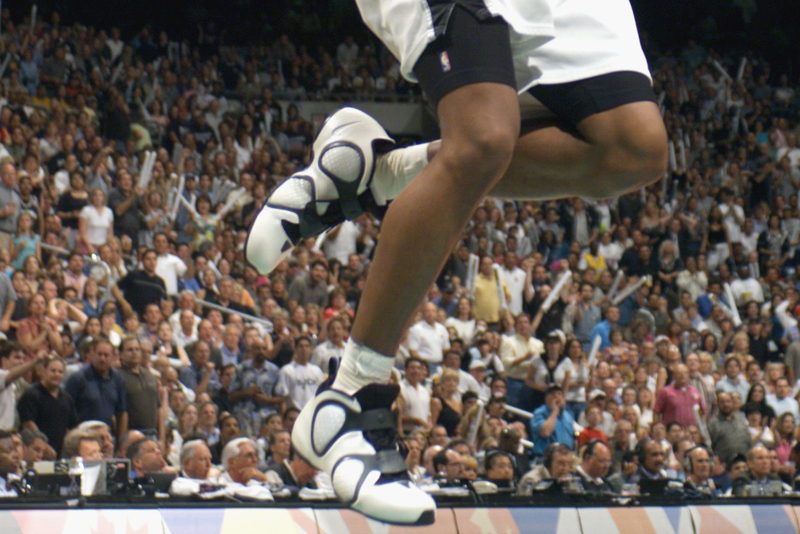 Duncan did win the 1999 NBA championship in his shoes, though. 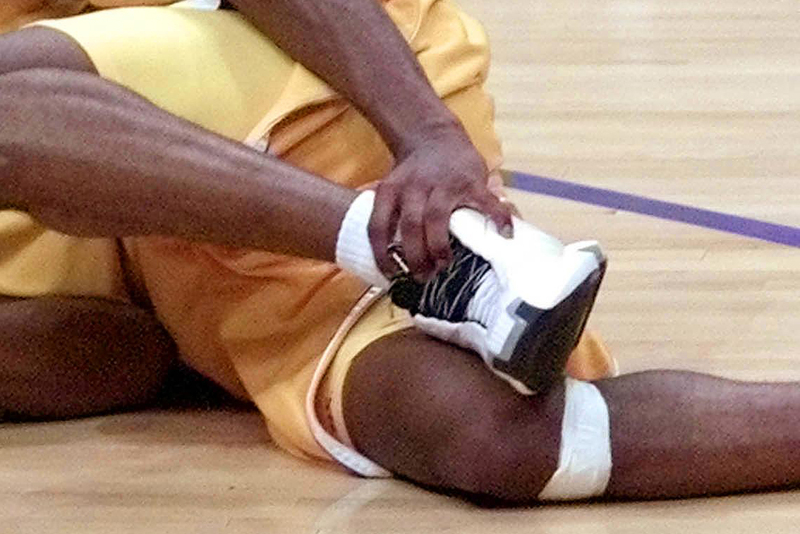 Kobe Bryant of the Los Angeles Lakers holds his injured ankle after becoming tangled up with Jalen Rose of the Indiana Pacers, June 9, 2000, during the first half of Game 2 of the NBA Finals at Staples Centers in Los Angeles. Before he was one of the faces of Nike, Kobe Bryant was endorsed by Adidas, signed by the company out of high school in 1996, when he was drafted. 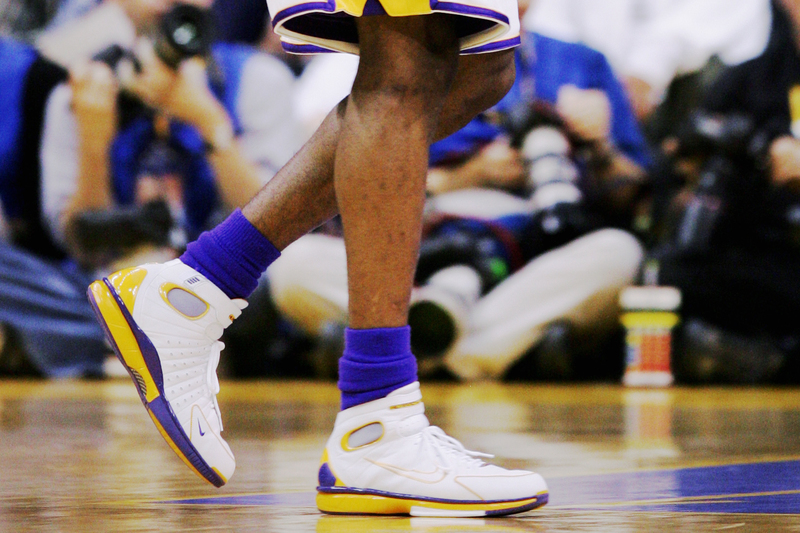 Bryant appeared in his first NBA Finals in 2000, when the Los Angeles Lakers faced the Indiana Pacers, and during the series he wore his third signature sneaker, the Adidas The Kobe. Perhaps the most memorable image of the shoe is that of Bryant lying on the Staples Center hardwood, writhing in pain as he clutches his foot. In the second quarter of Game 2, Bryant suffered a left ankle sprain after he went up for a jumper and his defender, Jalen Rose, landed on it. The injury forced Bryant to miss Game 3, although he returned for the remainder of the series to help lead the Lakers to the first of three straight championships. The sprain didn’t necessarily mean the shoe lacked ankle support — because Rose eventually admitted to purposely injuring Bryant. Allen Iverson (No. 3) of the Philadelphia 76ers during the 2001 NBA Finals against the Los Angeles Lakers at the Staples Center in Los Angeles. 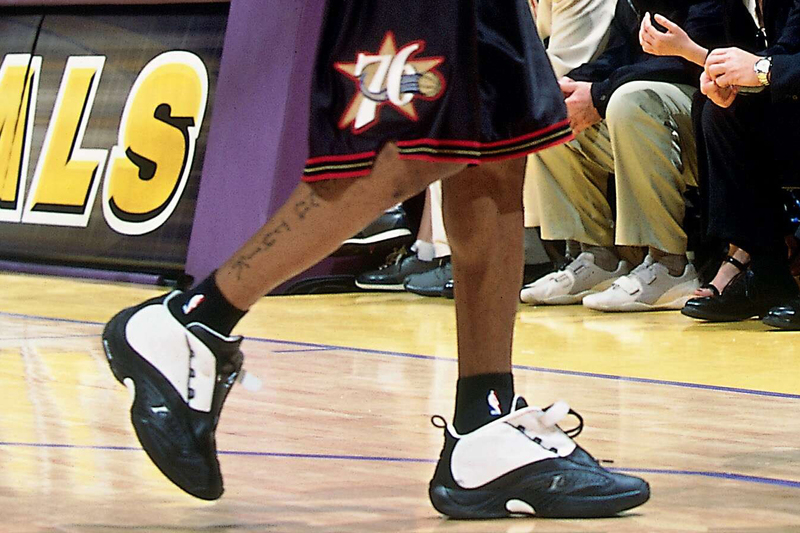 No one had a better view of the kicks Allen Iverson wore in the 2001 NBA Finals than Tyronn Lue. With less than a minute left in overtime of Game 1 between the Philadelphia 76ers and Los Angeles Lakers, Iverson translated his trademark crossover into a fadeaway jumper to seal the game. While contesting the shot, Lue fell to the ground and Iverson punctuated the swish (two of his 48 points on the night) by stepping over Lue in slow motion and planting both of his signature Reebok Answer IVs firmly on the floor. Everyone remembers Iverson’s “step over” — and the shoes he was wearing when he did it. Antonio Daniels (No. 33) of the San Antonio Spurs goes up for a shot during Game 3 of the Western Conference semifinals during the 2002 NBA Playoffs against the Los Angeles Lakers at the Alamodome in San Antonio on May 10, 2002. T.I. once said, “You ain’t gotta be a dope boy to have money.” In a similar regard, you ain’t gotta be a superstar to have some dope kicks. During the 2002 postseason, Antonio Daniels was far from a superstar, coming off the bench in all 10 of the San Antonio Spurs’ playoff games. But, boy, were his shoes sweet. Daniels rocked the Nike Air Flightposite IIIs in a white-and-black colorway that is virtually impossible to find on the resale market nowadays — even on eBay. Here’s to hoping A.D. still has a pair. Richard Hamilton (No. 32) of the Detroit Pistons played against the Philadelphia 76ers in Game 1 of the Eastern Conference Semifinals during the 2003 NBA playoffs at The Palace of Auburn Hills on May 6, 2003, in Auburn Hills, Michigan. On April 16, 2003, Michael Jordan played in the final game of his NBA career while wearing the white, royal blue and metallic silver colorway of his Air Jordan XVIIIs. Unfortunately for Jordan, with his Washington Wizards missing out on the playoffs, the shoes didn’t make it past the regular season — at least on his feet. Dallas Mavericks swingman Michael Finley and Detroit Pistons shooting guard Richard “Rip” Hamilton both swagged the XVIIIs during the 2003 postseason. For Hamilton, a former teammate of Jordan’s in Washington, it was a long time coming. The greatest of all time once told Rip that he wasn’t good enough to wear Jordans. Kobe Bryant of the Los Angeles Lakers in Game 1 of the 2004 NBA Finals against the Detroit Pistons at Staples Center on June 6, 2004, in Los Angeles. After six years with Adidas and a year as a sneaker free agent, Bryant inked an endorsement deal with Nike in the summer of 2003. 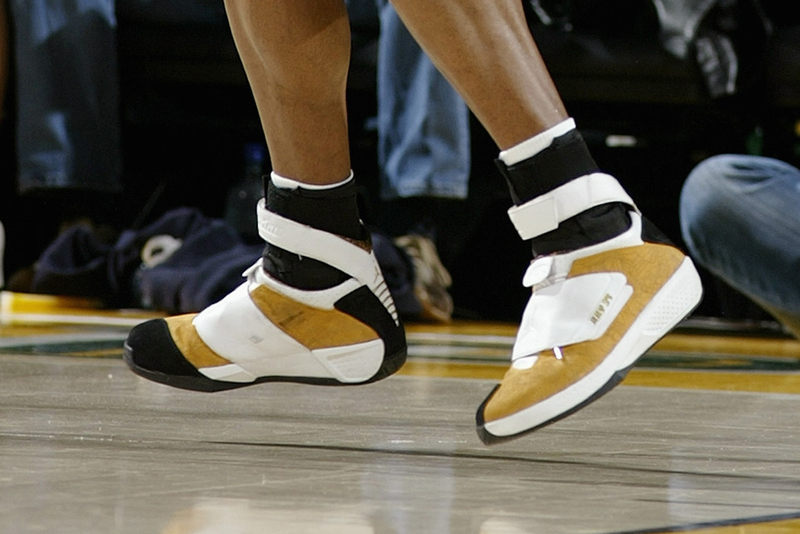 But not until 2005 would Bryant get his signature sneaker, so Nike tided him over with the Nike Air Zoom Huarache 2K4s. In the 2004 All-Star Game, Bryant wore the sneakers in red, white and blue. During the regular season, his Huaraches matched his Lakers uniform in either white, purple and gold, or black, purple and gold, depending on whether the team was home or away. The 2004 Finals brought a battle of the Huaraches, with Bryant in his Lakers colorways and Detroit Pistons guard Lindsey Hunter in the All-Star colorway. Hunter beat Bryant in his own shoes, with the Pistons winning the series, 4-1. Ray Allen of the Seattle SuperSonics in Game 1 against the Sacramento Kings in the Western Conference quarterfinals during the 2005 NBA playoffs at Key Arena on April 23, 2005, in Seattle. Ray Allen has been Team Jordan since day one. When Nike first announced the launch of Jordan Brand on Sept. 9, 1997, Allen’s name was listed in the press release among the original group of NBA players endorsed by the future multibillion-dollar sub-brand of Nike. Because Allen is an Air Jordan O.G., the player exclusive sneakers he received in 18 NBA seasons are next to none. The best in his PE collection? The Air Jordan XXs that he wore in multiple variations of his green, gold and white Seattle SuperSonics colors during the 2005 playoffs. How Allen pieced together the best postseason of his career (26.5 points per game) in a shoe with a flimsy ankle strap is beyond even the basketball gods. Dwyane Wade of the Miami Heat elevates for a dunk against the Dallas Mavericks during Game 2 of the 2006 NBA Finals played June 11, 2006, at the American Airlines Center in Dallas. When’s the last time a player dominated an NBA Finals in a pair of Converse? Surely in the 1980s, during the Magic Johnson and Larry Bird era … right? Nah. In the 2006 NBA Finals, a young Dwyane Wade threw it back to the good ol’ days, wearing his two-tone Converse Wade 1 Playoff Edition sneakers all the way to hoisting the Larry O’Brien Trophy for the Miami Heat. Wade was the best player in the series against the Dallas Mavericks, averaging 34.7 points in six games to earn the honor of Finals MVP. Since 2012, Wade has been endorsed by the Chinese company Li-Ning, after also spending a few years with Jordan Brand. But the first sneaker deal he signed as a rookie was with Converse. 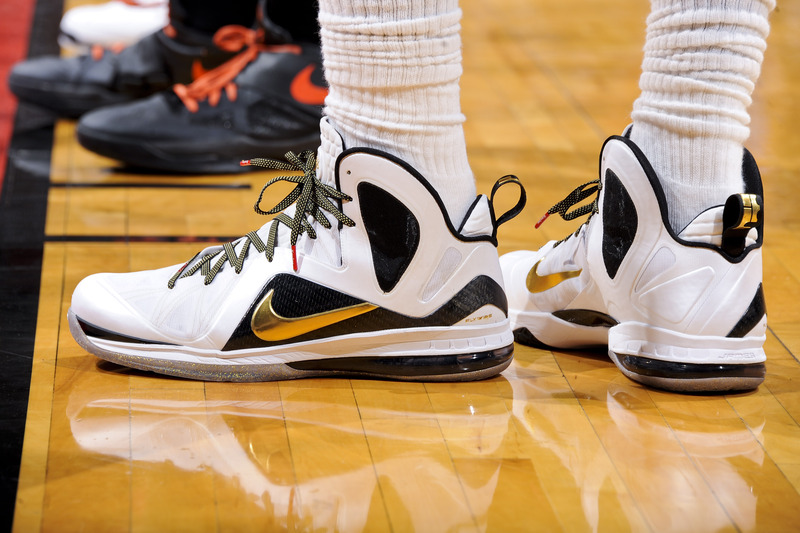 The new Zoom Soldier sneakers of LeBron James of the Cleveland Cavaliers in Game 4 of the 2007 NBA Finals at the Quicken Loans Arena on June 14, 2007, in Cleveland. It was hard not to marvel at the sight of LeBron James in the 2007 playoffs — especially in Game 5 of the Eastern Conference finals against the Detroit Pistons, when he dropped a whopping 48 points, including the final 25 of the night for the Cleveland Cavaliers in a double-overtime win. Two games later, we saw James lead the Cavs to the NBA Finals at the youthful age of 22, which Nike celebrated with the “We are all witnesses” marketing campaign in anticipation of James winning his first championship. 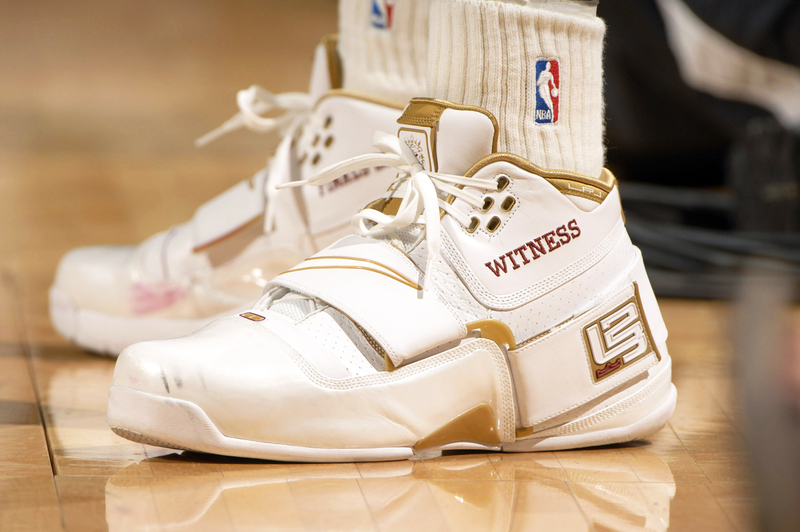 The company’s special gift to The King was two player exclusive editions of his Nike Zoom Soldier 1 (one pair in white, wine and gold for home games, and the other in navy, white and gold for the road) which featured the motto “Witness” on the outer sole of each shoe. The San Antonio Spurs swept the Cavs, 4-0, to end James’ magical 2007 playoff run. Kevin Garnett of the Boston Celtics wears a pair of unique Adidas sneakers in honor of the 2008 NBA Finals against the Los Angeles Lakers on June 17, 2008, at the TD Banknorth Garden in Boston. When Ray Allen and Kevin Garnett were traded to the Boston Celtics in the summer of 2007 to join forces with Celtics stalwart Paul Pierce, it wasn’t a question of if, but rather when the “Big Three” would bring an NBA championship back to Boston for the first time since 1986. The Celtics wasted no time. In the first season of the Big Three era, Boston won the title in a throwback series against the Los Angeles Lakers. 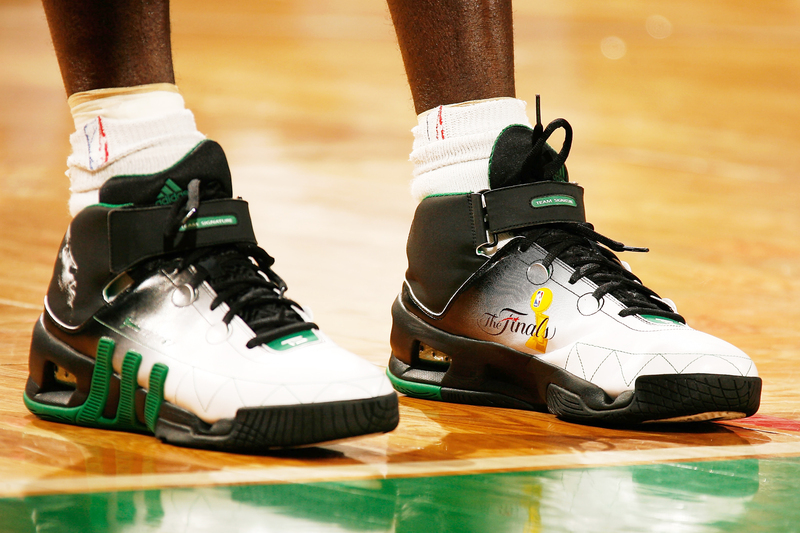 During the 2008 Finals, Garnett wore the limited edition Adidas Team Signature KG Commanders, which commemorated Boston’s run to the title and Garnett’s first Finals appearance with his face on each shoe’s outer sole and an illustration of the Larry O’Brien Trophy on the inner soles. Adidas released only 48 pairs of the shoe (eight for each of the series’ six games), sold at retail for $1,017 each. All profits were presented to the NBA Cares community partners in the Boston area. In his first season in Boston, Garnett gave back in more ways than one. A view of Los Angeles Laker Kobe Bryant’s shoes during Game 1 of the 2009 NBA Finals against the Orlando Magic at Staples Center on June 4, 2009, in Los Angeles. On Feb. 2, 2009, Kobe Bryant went into Madison Square Garden and put up a monstrous 61 points against the New York Knicks. 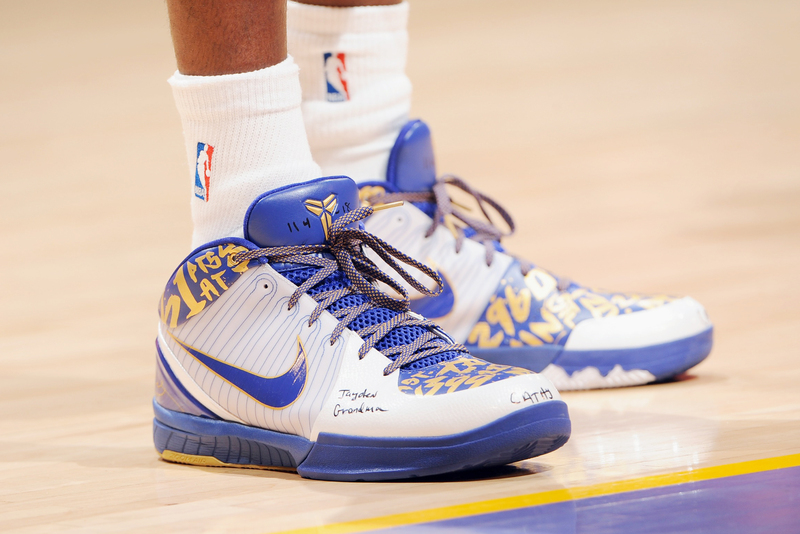 Four months later, when the Los Angeles Lakers advanced to the NBA Finals to face the Orlando Magic, Bryant came out in the special edition Nike Zoom IV “61 Points” in both home and away colorways, which paid tribute to his historic scoring night at MSG and the Lakers’ run to the Finals with a Sharpie scribble-style design. Like he did to the Knicks in February, all Bryant did was score against the Magic in June, averaging 32.4 points in L.A.’s 4-1 series win. After the Finals, Nike rolled out an updated version of the shoes, the Nike Zoom IV “Finals Away,” featuring the letters “MVP” on the tongue of each shoe — a nod to Bryant being named the 2009 Finals’ most valuable. A detail of sneakers worn by Rasheed Wallace of the Boston Celtics against the Orlando Magic in Game 5 of the Eastern Conference Finals during the 2010 NBA playoffs at Amway Arena on May 26, 2010, in Orlando, Florida. 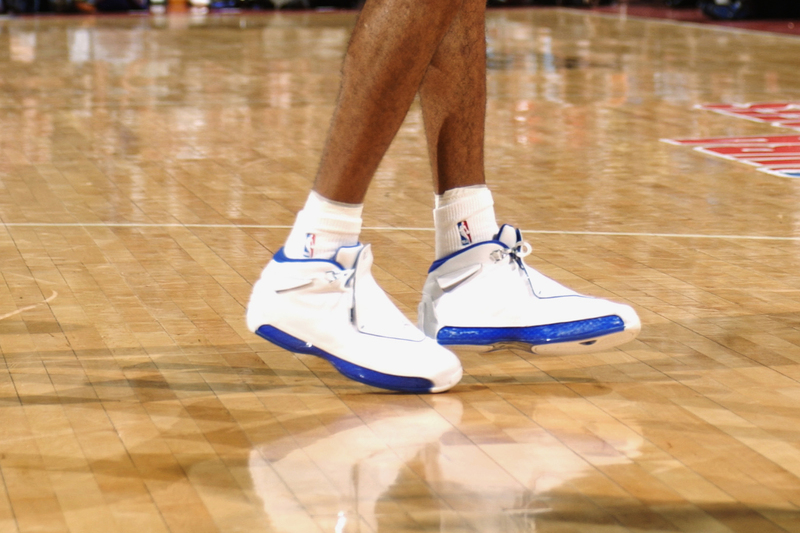 Rasheed Wallace had the swaggiest sneaks in the 2010 Finals — fact. Playing for the Boston Celtics in his second-to-last season in the NBA, Wallace balled against the Los Angeles Lakers in some green patent leather high-top Nike Air Force One PEs. He’d begin games with the shoes strapped up tight, but as the night went on he’d let that ankle strap hang like he was on the blacktop. In Wallace’s 15 NBA seasons, Air Force Ones were his staple, so Nike gave him a stockpile of PEs, which featured a silhouette of him shooting a fadeaway jumper. Derrick Rose of the Chicago Bulls walks towards the bench against the Miami Heat in Game 5 of the Eastern Conference Finals during the 2011 NBA layoffs on May 26, 2011, at the United Center in Chicago. It’s easy to forget that Derrick Rose was once the best player in the NBA. Every now and then he’ll show flashes of his healthy past, but it’s hard to imagine that he’ll ever match the version of himself that was so fun to watch during his NBA MVP-winning 2010-11 season. That year, the Chicago Bulls earned the No. 1 seed in the Eastern Conference over a Miami Heat team led by LeBron James, Dwyane Wade and Chris Bosh. 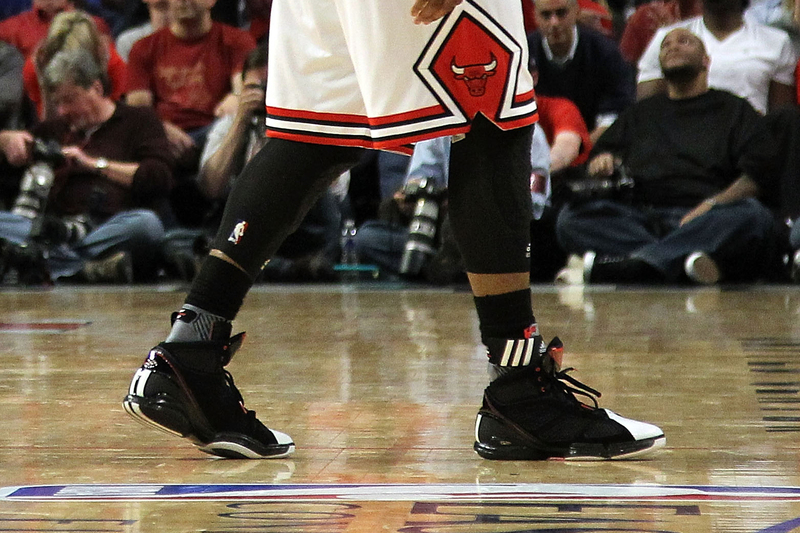 Playing in his signature Adidas adiZero Rose 1.5s, Rose averaged 27.1 points and 7.7 assists in the playoffs, taking the Bulls to the Eastern Conference finals, though the Heat claimed the series over Chicago, 4-1. Based on Rose’s numbers and durability (he played 97 games during the 2010-11 season), the adiZero Rose 1.5s appeared at the time to be the best-performing basketball shoes Adidas had ever released. Now they’re yet another relic from his now unbelievable season. LeBron James of the Miami Heat wears Nike sneakers while playing against the Oklahoma City Thunder in Game 4 of the 2012 NBA Finals at American Airlines Arena on June 19, 2012, in Miami. In 2007, he couldn’t get it done in the Nike Zoom Soldier 1s. Four years later, he fell short in the Nike LeBron 8s. But finally in 2012, LeBron James won his first NBA championship. And when James hoisted the Larry O’Brien Trophy after defeating the Oklahoma City Thunder in five games, he was wearing the white, black and gold-accented Nike LeBron 9 Elite “Home.” Like Michael Jordan winning his first title in the Air Jordan XIs and Kobe Bryant winning his first in the Adidas The Kobes, the Nike LeBron 9 Elites will forever be connected to The King’s championship legacy. 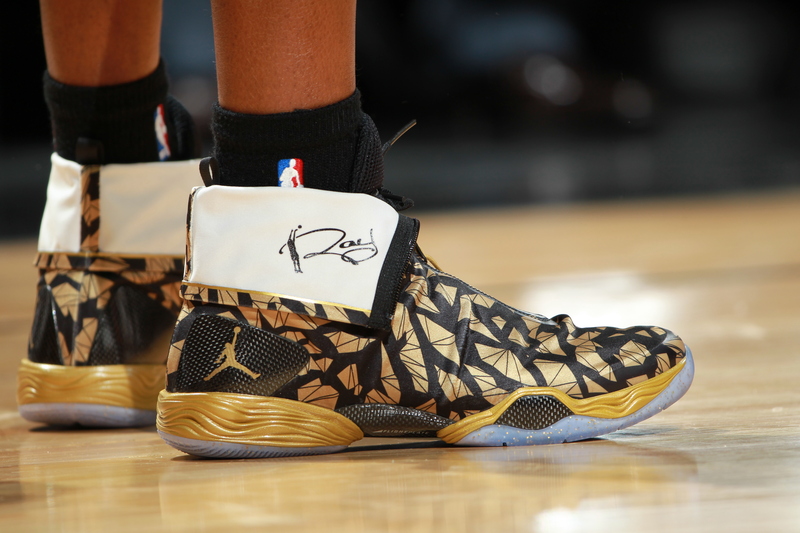 The sneakers of Ray Allen of the Miami Heat during Game 3 of the 2013 NBA Finals on June 11, 2013, at the AT&T Center in San Antonio. If the Air Jordan XXs that Ray Allen wore in the 2005 playoffs are his best PEs, the line of Air Jordan XX8 PEs he wore in 2013 playoffs are a close second. 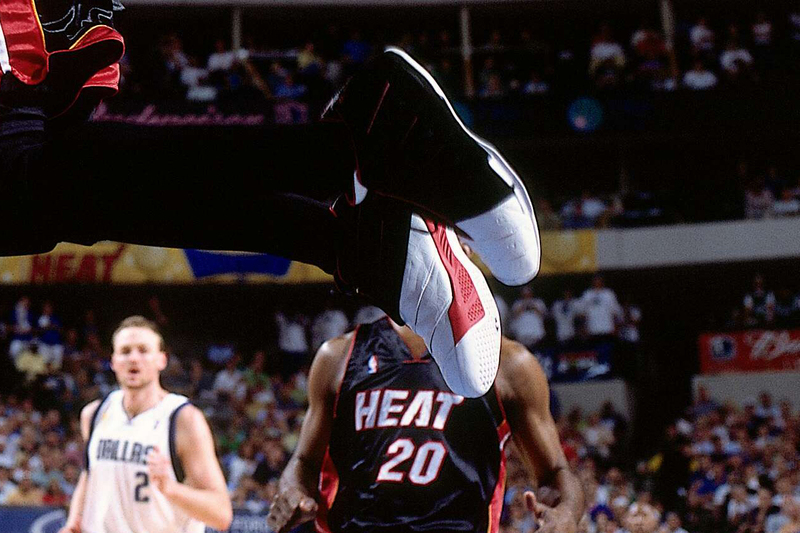 Allen certainly had a bigger moment in the XX8s — arguably the biggest shot of his career. In the waning moments of Game 6 of the 2013 Finals between the Miami Heat and San Antonio Spurs, Allen scurried back across the 3-point line and hit a heroic game-tying deep ball with 5.2 seconds left. Allen and the Heat stole Game 6 and beat the Spurs in Game 7 to win the title. Weighing in at just 13.5 ounces, the XX8s are the lightest Jordans ever made. So who knows, if Allen had been wearing a different (and heavier) sneaker in that moment, maybe he wouldn’t have made it back across the line. Maybe the Spurs would’ve won in 2013? Manu Ginobili of the San Antonio Spurs showcases his sneakers against the Oklahoma City Thunder during Game 1 of the Western Conference Finals during the 2014 NBA playoffs on May 19, 2014, at the AT&T Center in San Antonio. 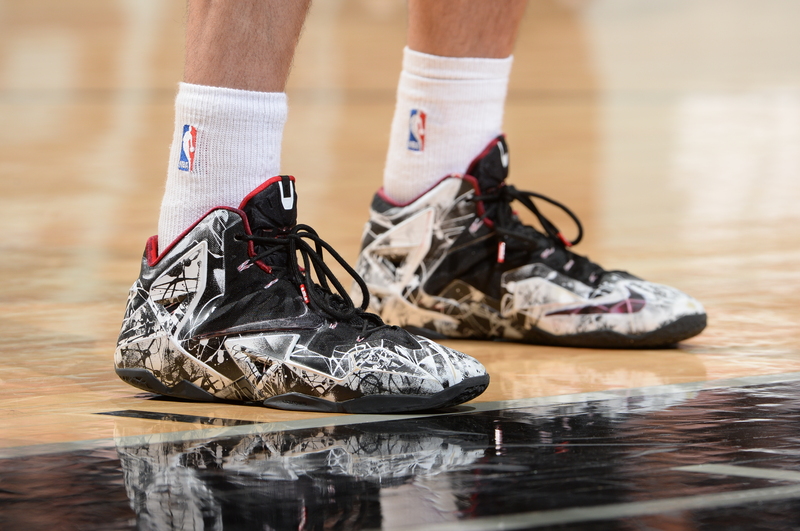 It must have been humbling for LeBron James to see his opponent, Manu Ginobili, come out in Game 1 of the 2014 Finals between the Miami Heat and San Antonio Spurs in a pair of Nike LeBron 11 PEs. Then James must’ve felt some type of way four games later when Ginobili was celebrating his fourth NBA championship in the 11s. Yes, Ginobili beat James in his own shoes. Savage. 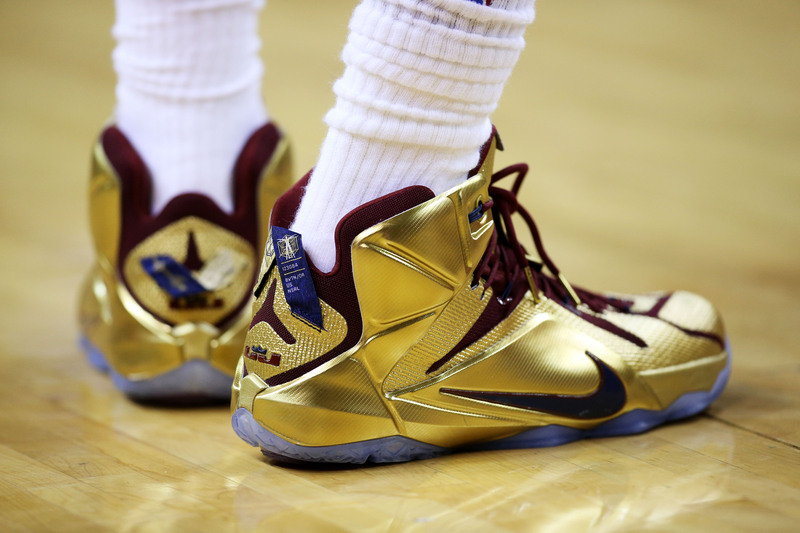 A detail of the shoes of LeBron James of the Cleveland Cavaliers in the third quarter during Game 6 of the 2015 NBA Finals against the Golden State Warriors at Quicken Loans Arena on June 16, 2015, in Cleveland. One of the most disrespectful things in the game of basketball is LeBron James being denied the Finals MVP award in 2015. It went to Golden State’s Andre Iguodala as James lost in his first year back with the Cleveland Cavaliers. But James absolutely dominated the series, averaging 35.8 points, 13.3 rebounds and 8.8 assists a game. He also was a sneaker showman in the series, wearing seven different pairs of Nike LeBron 12 Elite PEs in six games (he swapped shoes during Game 3). We can only imagine what he would’ve whipped out had the series gone to a Game 7. A view of the sneakers of Stephen Curry of the Golden State Warriors during practice and media availability as part of the 2016 NBA Finals on June 12, 2016, at Oakland Convention Center in Oakland, California. At the beginning of the 2016 Finals between the Golden State Warriors and Cleveland Cavaliers, two-time NBA MVP Stephen Curry’s signature Under Armour Curry 2 Low “Chef” sneakers were released. 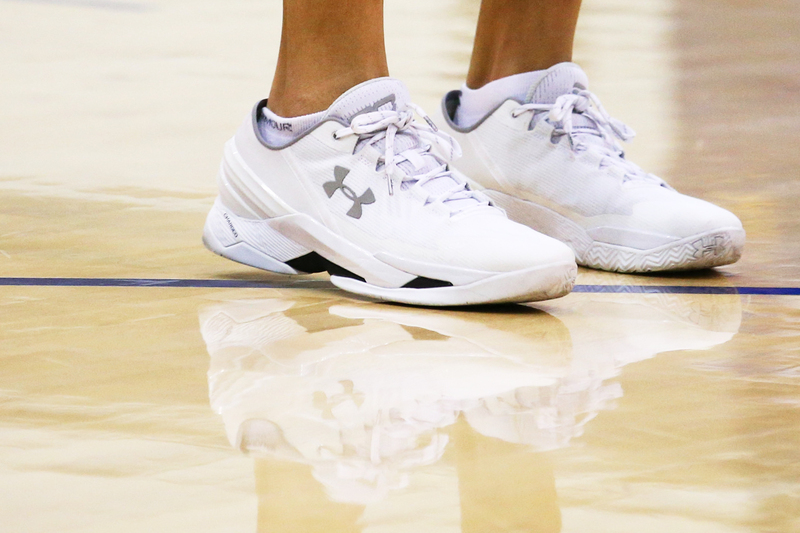 And when Twitter got a hold of a picture of the low-cut, plain-Jane white shoes, the roasting began, with people calling them everything from the “Let Me Speak to Your Manager 5s,” to the “Life Alert 3s,” and the “Yes, Officer, I Saw Everything 7s.” Curry pettily clapped back at the haters when he wore the shoes to practice after a win over the Cavs in Game 4. He reportedly wanted to play in them in Game 4, but Warriors general manager Bob Myers and his agent, Jeff Austin, talked him out of it given his history of ankle injuries. Maybe if Curry would’ve worn the Chefs in the series the Warriors wouldn’t have blown a 3-1 … never mind. Isaiah Thomas of the Boston Celtics ties his shoes, with messages dedicated to his late sister Chyna Thomas, who was killed in a car accident April 15 during the first quarter of Game 1 of the Eastern Conference quarterfinals against the Chicago Bulls at TD Garden on April 16 in Boston. It only took one game for the most important sneakers of the 2017 playoffs to be determined. A day after his 22-year-old sister, Chyna, was killed in a car accident in their home state of Washington, Boston Celtics star Isaiah Thomas played in Game 1 of a first-round series against the Chicago Bulls in a pair of Nike Kobe A.D.s PEs that he customized by writing the words “CHYNA I Love You,” “CHYNA R.I.P. Lil Sis” and “4-15-17,” the date she died, on them. 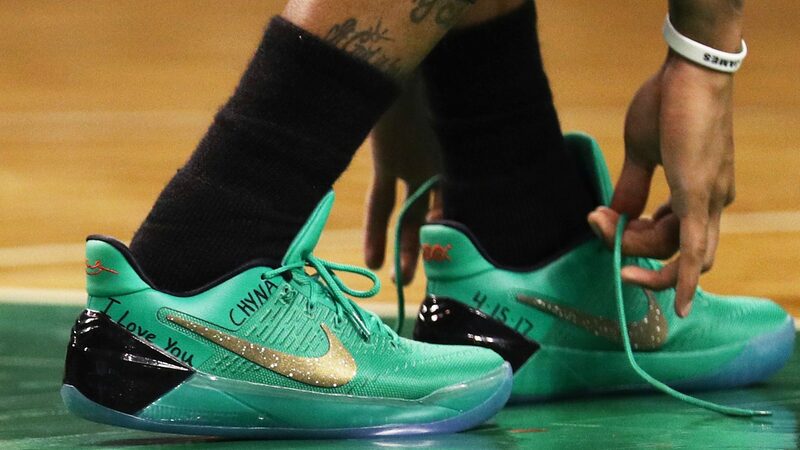 The sneaker tribute could not have been a better way to remember his late sister on the court.